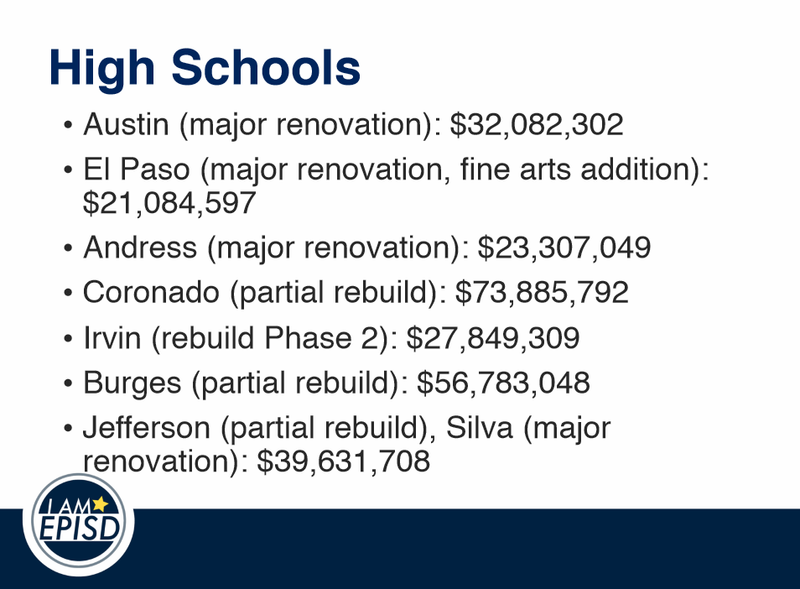 Do you remember what EPISD told us they were going to do to Andress high school with the bond money they were asking us for? They told us that they were going to do “major renovations” to the school. What happened to the renovations? This entry was posted on Friday, February 1st, 2019 at 5:00 AM and is filed under El Paso Independent School District. You can follow any responses to this entry through the RSS 2.0 feed. You can leave a response, or trackback from your own site. What did you expect? No entity in this region has ever done what they promised in a bond issue. There are always cost overruns, scope changes and killed projects because once the yes vote is attained the donor-led agenda that drove the bond issue in the first place rules. That said the described projects could loosely fit the term renovation. Expanding the list of schools in the original plan was a vote-getting strategy. The folks in the Andress district are probably now wishing they had their votes back. It’s EPISD. What do we expect? The State or Department of Justice, FBI, need to assign a crew of Investigators to EPISD. More and more TAXES and less to show for any of it and yet THEY keep TAKING from US. Where does the money go? Cabrera’s BENEFITS, pay INCREASES?? These people are as corrupt as Lorenzo Garcia and his “.Crew”.